Now featuring our new "Foreverwear Finish" which provides longer unit life. Add flair to nameplates, signs, trophy plaques & more! If you have materials requiring Rounding, Notching, Scalloping, Slotting or Piercing then these are the tools you will want! 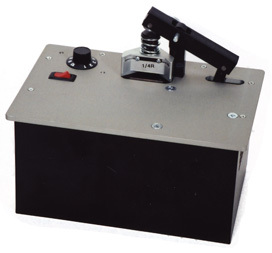 Choose from our standard base, which accepts all but our largest punches, or our large base, which accepts them all. Great prices & super quality - manufactured and assembled on site. Need A More Powerful Solution? For easier use and greater productivity on high-volume punching, try an Electric Corner Shaper, with variable speed motor. Just set the motor speed, and you can slide your pieces right in. 1/8 3/16 1/4 5/16 3/8 1/2 5/8 3/4 1"
Weight : 3 lbs. 4.25 lbs. 13 lbs. Thickness : Brass - 0.030"
Plastic - 0.063" Brass - 0.030"
We also resharpen punches, at a reasonable price. 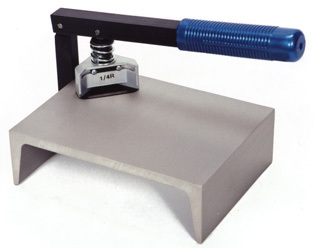 Resharpening and shipping can take some time, though, so consider having spare punches available. This site designed & maintained by Loop Ventures. Edge-Rite logos, photos, graphics and original text are Copyright © 1998-2002 by Edge-Rite Tool Co., Inc., All Rights Reserved. All HTML Coding Copyright © 1998-2002 by Loop Ventures, All Rights Reserved.